We have a host of products that we are working on in different stages. Our immediate offering is Touché – a refreshable Braille display e-reader which we hope will reach end users in 3 months time. 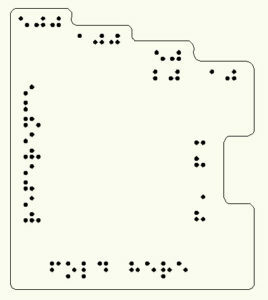 Touché – An E-Reader Braille display. Touché Plus – A refreshable Braille display with integrated Braille keyboard (note taker). Tiffy Template – a currency note identifying template for the blind in India. Tactile Books for the sighted and visually impaired. Touché Type – a Low cost Brailler. 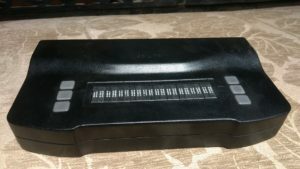 This advanced version of the Touché refreshable Braille display will have an input device in the form of a Braille keyboard that will allow the user to input data and store data. This device will be an IO device which is pretty much a fully functional computer for the visually impaired. A simple low cost invention that has ensured financial independence and freedom from fraud for the visually impaired. This template has been crowd funded on Fueladream with the aim of distributing it to over 2 million blind people in India. This is available free to any blind person in India. All we need is a request by email to tmttblr@gmail.com with name, shipping address and quantity required, and we will ship them to you absolutely free! Tactile Books for the visually impaired and sighted. A sample page from a tactile book designed to be used by the sighted and visually impaired alike. Children derive great fun out of story books, we have produced a couple of very interesting characters which will enthrall children with their amusing adventures. Also, these books are printed using technology which will make them equally enjoyable and accessible to visually impaired and sighted students alike. 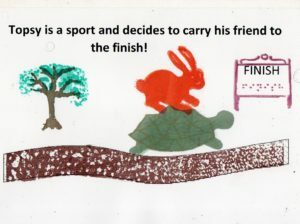 All illustrations have tactile features and texture variations that can be felt by the visually impaired. Not visible, but present in the illustration, is Braille text. We are working on a low cost Brailler which will make personalised typing out notes and books far more affordable and easier for the visually impaired. The Perkins Brailler has been around for over half a century and is probably the heaviest and most cumbersome device a Braille user can possess. It is also prohibitively expensive. We aim to substitute this device with a sleek, low cost, lightweight replacement. We will share further details at the earliest.